Tommy Bolin. The Ultimate Photograph Collection. At last – the Ultimate guitarist gets the Ultimate Photo Book…. NEWSLETTER : You will be able to keep up to date with news and progress on this title via a dedicated newsletter service, along with early publication information and pre-publication offers. This will keep you in the loop over the coming months and guarantee you get the news before anyone else. You will be asked to confirm your email address and can unjoin at any time. In a relatively short but intense career, guitarist Tommy Bolin drew acclaim and attention wherever he went and whatever he did. His work both on-stage and in the studio continues to influence generations of musicians and inspire the devotion of fans in America and round the world. Tommy certainly lived the rock and roll lifestyle at times, but he also had a gentler nature which endeared him to many. On top of this Tommy simply looked the part; with his long streaked hair, an individual sense of style and a magnetic on-stage presence, it would be hard to imagine him ever doing anything else for a living. And it is this side of Tommy which this new book plans to focus on. For while the archive CDs continue to appear, and text-heavy biographies exist, there has never before been a book which fully celebrates Tommy Bolin’s life and work in pictures. 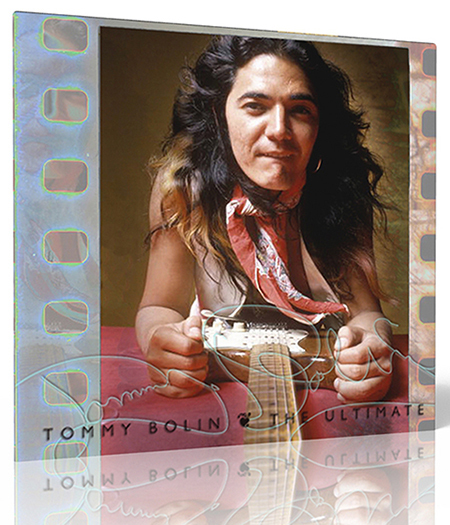 Tommy Bolin: The Ultimate Photograph Collection brings together an unrivalled collection of photographs. Hundreds of images, many rare and unpublished, taken both on and off stage, in public and in private, fill the book. Some you may recognise, most you will not have seen before, all printed in superb high quality. Supporting and adding context to the photographs are the words of friends and musicians who worked with Tommy. The photographs aim to capture his early teenage bands, through his days with Energy and Zephyr, the move into hard rock with The James Gang and of course his ground-breaking jazz rock playing with musicians like Billy Cobham and Alphonse Mouzon. Tommy’s rise to the very top with Deep Purple and the subsequent solo albums and tours are also comprehensively represented. We’ll level with you. We are all huge Tommy Bolin fans at Stereo33Books and this title will be produced to the highest printing and publication standards, with real attention paid to the design and layout. The aim is to deliver a book which we would want to buy ourselves. In large format, it will be published as a limited edition, available worldwide via mail-order only. It won’t be the cheapest book around, but we aim to make it the best. Tommy Bolin: The Ultimate Photograph Collection is authorised by Johnnie Bolin and the Bolin Estate, with the input of many professional photographers, long time friends, fans and collectors. Research and production is already underway with publication due in 2018. The first announcement of the book was made at the Bolin Festival held each year in Tommy’s home town of Sioux City. PRODUCERS : This title is being co-ordinated and designed by Simon Robinson, who has written about Tommy over the years in British publications (and helped with a number of archive CDs). Rock writer and radio presenter Jon Kirkman has spoken to many of the musicians involved with Tommy over the years and is talking to a number of them afresh specially for this new book. CONTRIBUTE : as with all our titles, we are happy to have contributions from fans – photographs, memorabilia or recollections of seeing Tommy. Please contact us through the website first before sending anything. How can I buy a signed copy? Would be good if there was bit of background to some or all of the photos, when, where why? Looking forward to see if there are any ‘new’ images. Hi Julia, the best way to keep up to date is to bookmark this site, or subscribe to the Tommy Bolin newsletter. It is not possible to mail newsletters out by post due to the cost. I want to purchase a copy of the book. Need a copy!! Thank you! I’d like a copy of this book. I photographed two of the Tribute concerts and was hopeful to be contacted regarding use of some of these historic photos but never heard from anyone. Still interested in the book. Our aim is to make this a Tommy book, I had not thought about the tribute shows. But we might look at a few pages at the end of the book. We are still working on getting material together, but our other titles have delayed work on starting the layout.